The aim of the study was to assess levels of chemotherapy-induced nausea and vomiting (CINV) in routine practice. The study was an observational prospective evaluation using patient self-reports. 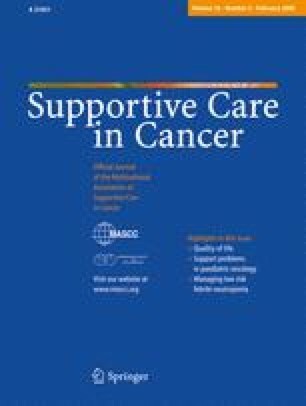 One hundred and two patients with cancer in a single cancer centre in UK receiving their first chemotherapy treatment participated in the study and were followed up over four cycles, providing a total of 272 assessments of nausea and vomiting. Data was collected with the use of the MASCC Antiemesis Tool (MAT), which is an eight-item short clinical scale assessing acute and delayed nausea and vomiting after chemotherapy. Results indicated that acute vomiting was experienced by 15.7% of the patients in cycle 1 and delayed vomiting by 14.7%, while acute nausea was present in 37.3% of the patients and delayed nausea in 47.1%, increasing over the subsequent cycles. Moderately emetogenic and highly emetogenic chemotherapy had the highest incidence of CINV, whereas patients receiving highly emetogenic chemotherapy showed significant levels of delayed nausea. Acute symptoms were more easily controlled than delayed symptoms. The data suggest that, while vomiting is well controlled, nausea remains a significant problem in practice, and optimal management of CINV is yet to be achieved. Understanding more clearly the biological basis of nausea will assist in managing this complex symptom more effectively in practice. The study was funded by an unrestricted grant from Merck.